The epic finale to Robert Kirkman and Jay Bonansinga's New York Times bestselling Governor storyline! 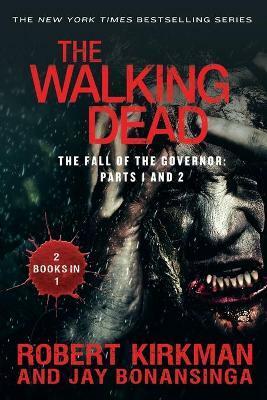 The Walking Dead original novel series, set in the universe of Robert Kirkman's iconic comic book, continues with The Fall of the Governor. From co-authors Kirkman, creator of the Eisner Award-winning comic as well as executive producer of AMC's blockbuster TV series, and Jay Bonansinga, Stoker Award-finalist and internationally acclaimed author, comes the gripping third novel in this richly woven, page-turning literary saga, which began with The Walking Dead: Rise of the Governor. In Rise of the Governor, uber-villain Philip Blake journeyed from his humble beginnings directly into the dark heart of the zombie apocalypse, and became the self-proclaimed leader of a small town called Woodbury. In The Road to Woodbury, an innocent traveler named Lilly Caul wound up in the terrifying thrall of Phillip Blake's twisted, violent dictatorship within Woodbury's ever tightening barricades. And now, in The Fall of the Governor, the Governor's descent into madness finally erupts in a tour de force of action and horror. Beloved characters from the comic book, including Rick, Michonne, and Glenn, finally make their entrance onto this nightmarish stage, and fans of The Walking Dead will see these characters in a whole new light. Simmering grudges boil over into unthinkable confrontations, battle lines are drawn, and unexpected twists seal the fates of the innocent and guilty alike. ROBERT KIRKMAN is the creator of many popular comic books, including The Walking Dead, Invincible, and Super Dinosaur. In addition to being a partner at Image Comics, Kirkman is an executive producer and writer on The Walking Dead television show. In 2010, Kirkman opened Skybound, his own imprint at Image, which publishes his titles as well as other original work. JAY BONANSINGA is a New York Times bestselling novelist, his debut novel, The Black Mariah, was a finalist for a Bram Stoker Award.